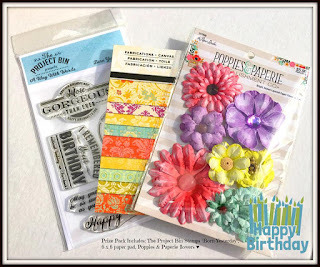 The Nickel Nook: Denise's *Happy Birthday* Blog Hop & Stamp Giveaway! Denise's *Happy Birthday* Blog Hop & Stamp Giveaway! In honor of Denise's birthday, her design team is hosting a blog hop to showcase her wonderful stamps! If you just stumbled upon the hop, you'll want to start at the beginning with Angela's amazing blog (add the hper link) and finish with The Project Bin blog. One lucky winner will win a prize package, including a brand new The Project Bin stamp set. It is hidden on one of the stops on the hop! If you haven't seen the stamps at The Project Bin, there is truly something for everyone! The Project Bin has it all - perfect for all your card making needs. In order to win the blog candy giveaway, make sure to stop at each blog on the hop and leave a comment. Then, head over to The Project Bin blog and leave Denise some birthday love! and the winner will be chosen on January 1, 2017. Next up, head on over to Patricia's blog and see her special card for Denise. Sweet Card--love the colors you picked! Oh, how cute this is!!!! I love the polka dots and the cupcake designer paper!!! LOVE this sentiment soooo much! Absolutely adorable card! Nancy I love love love your card! What a fun image and it's gorgeous in this color scheme! The papers are just perfect. Thank you for being such a sweet member of TPB and a fabulous stop on the hop! Hugs! Fancy cupcakes! Really pretty card, Nancy! You´ve picked the right sentiment for your card ! The DP and die cuts fits perfectly. Happy Birthday to Denise ! Great job on the card, bright and lots of colors, great stamp, awesomeness with the Blog Hop! Nancy, this is awesome!! I'm so touched by what you guys did!!! Fantastic card! Great colors and layers! Love the stamps. How true your sentiment rings out. Your cupcake die just goes perfect with the sentiment. This is darling and love all the eye candy you used especially your double bow. Love the cupcake die. ooh, I love the orange and blue..and the polka dots are super sweet Great job on today's hop! So fun. Makes me want my birthday to come. This card is just the cutest. You did another fabulous card Nancy. Love the colors. This sentiment is so perfect to send to most of my friends! Love your card design that you fit it in die. that is the perfect labels sentiment to hold this large greeting. it looks fab. What a fun card... the cupcake dies are interesting! The DP used as a layer under the cutouts of the die cut looks really good! I like the orange and blue hues together. Nice card! Awesome layering and fun papers! Happy Birthday to Denise! Love the sentiment and you can never go wrong with a cupcake theme! :) Good luck for the hop! Love your card Nancy , love the papers and the label die cuts. The sentiment is fabulous !